These are the perfect seasonal treat without any over indulgence. 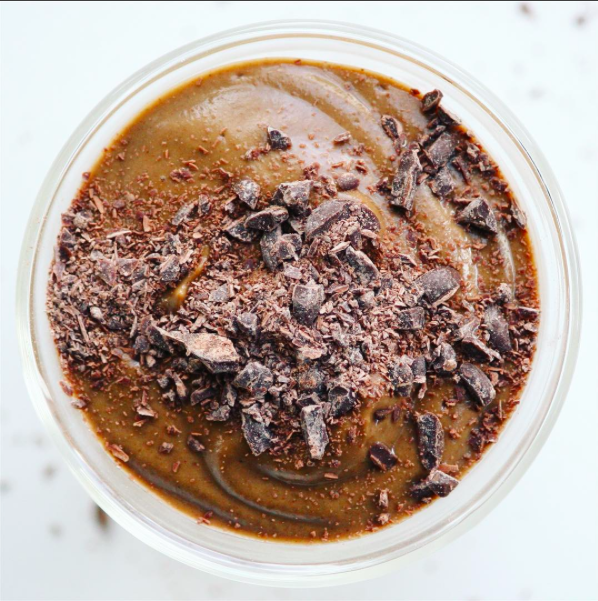 The frozen banana and chia seeds whip up into a thick creamy pot of pumpkin spice gold that’s perfect for us here when it’s almost November but still HOT! They work well as a breakfast or a dessert with all plant based ingredients and no added sugar beyond fruit. You could add a scoop of protein powder and a little more milk to make it a more complete meal or customize them however you want. They work well with sweet potato too. I like my smoothies really thick to eat with a spoon but just blend and add and blend and add till it’s perfect for you! This is the kind of recipe I keep on hand to make sure I feel like I’m enjoying the season and eating fun seasonal food, without indulging in all the sugar and pie that’s around for the holidays. You can read my other 10 tips on that in my post 10 Tips to Enjoying the Holiday Season without Regret! 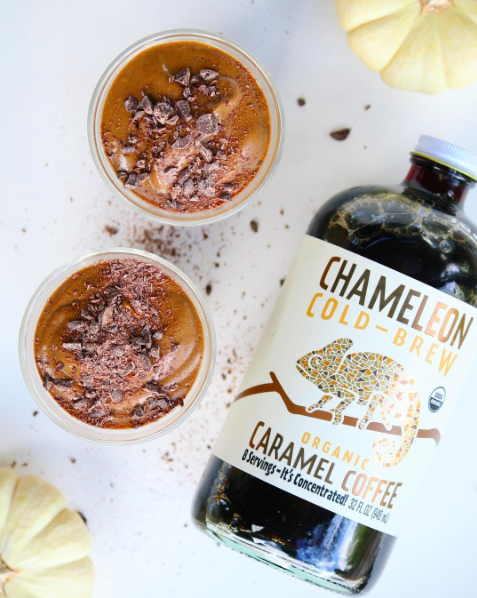 6oz @chameleoncoldbrew caramel coffee concentrate (or any cold brew but this stuff is gold, ethically sourced, organic and clean). Just throw everything in a blender blend it all up really reeeally well. Pour it into two glasses, or a bowl for one if you want a bigger coffee boost, then top with dark chocolate chunks, and dive in. You can also put it in the fridge overnight to thicken up. Enjoy! I’m obsessed with pumpkin so I’m trying every clean pumpkin recipe I can this fall! This one looks AMAZING. My one question is, where do you buy that cold brew?? Thanks for sharing! I get mine from our local target! How do you cook pumpkin? Are there any shortcuts? Haha thank you for sharing! Just bake at 350F for about an hour!